Seto Kaiba: Funny, I was just thinking the exact same thing. 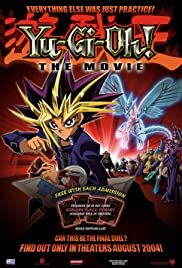 I semi-willingly took my 7 year old to this movie as he loves the cards and watches the cartoons on TV. While he was staring and the screen in a comatose stupor - I thought....Why wasn't this stuff on TV when I was a kid. Then I realized, "oh yeah...We didn't make this level of CRAP back then!" This movie is so boring, unimaginative, contrived, and cumbersome! I know that it is quite popular and undoubtedly will result in $$$$ from parents like me who want to take their kid to a movie they want to see...but HOLY COW!!! This movie has no redeeming qualities. It, albeit unintentionally, condones violence, and is supposed to have some kind of moral message about loyalty and perseverance...an average 7 year old will "get" the overly subtle (or weak) connections. Go rent Fantasia instead.